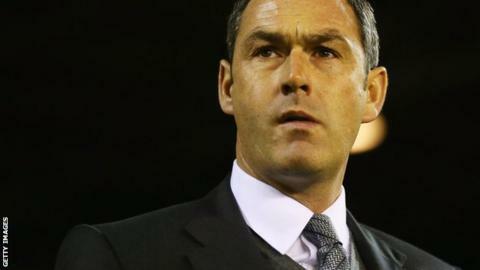 Paul Clement leaves Derby: Is his sacking the strangest this season? Despite their poor run of results, the Rams remain fifth in the Championship table. The FA Cup exit came against a rejuvenated Manchester United - hardly a disgrace. Although they failed to win any of their first six games, Derby have lost just five of their 30 league matches this season - only fourth-placed Brighton, with four defeats, have lost fewer. After a slow start, Clement oversaw a run of just one defeat in 19 games, which saw the Rams top the table as recently as Boxing Day. "The sacking is definitely a shock - particularly when as recently as two weeks ago chairman Mel Morris was privately insisting Clement was the man for the job and would be given time. "It's caught people at the club by surprise, including some of the more senior figures. "The run of form has been poor, but for a chairman not supposedly concerned with promotion this season, why would the results matter? "The key reason for the decision seems to be the style of football. It has struggled to reach the quality that Morris was used to watching in the early days under previous boss Steve McClaren. "Derby are insisting that the new head coach, Darren Wassall, will get to the end of the season. But, given what has just happened, it's understandable that some fans are sceptical and expecting a new face sooner rather than later. "It is very much Wassall's job to lose, which is staggering considering they have just got rid of one rookie manager." Derby Evening Telegraph's Derby County correspondent Steve Nicholson is confused by the club's statement which followed Clement's exit. "And it would appear quite a number of supporters are also puzzled," he added before analysing the club's reasoning in depth. His take on the "Derby way" makes particularly interesting reading. "I have never quite been sure what the term 'the Derby way' means," he said. "I am sure it does not encompass what we saw in the final three months of last season, or I hope it doesn't. "We have to be careful not to fall into the trap of style over substance because football is about winning, and knowing how to win. Successful teams are able to win games in all sorts of ways in the Championship, not just in one way. "If I am not mistaken, one of the criticisms levelled at Steve McClaren's Derby is that they had no Plan B when Plan A was scuppered." Seemingly still well set to challenge for promotion, and having also publicly stated that reaching the Premier League was not this season's main objective, why did Morris back-track in such a startling fashion? Morris said appointing Clement was "pivotal" to the aim of becoming a sustainable Premier League team. In November, when the Rams were riding high, he told BBC Radio Derby's Sportscene that Clement had the chance to build a lasting dynasty in the manner of Sir Alex Ferguson at Manchester United. Ferguson managed United for more than 26 years, while Clement managed just 36 weeks. Ferguson was in charge at Old Trafford for 1,500 games. Clement oversaw 33 at Derby. But the brave new dawn was not just about substance, Morris has explained. It needed style to go with the substance. Morris feels both are missing. Hey big spenders, where's the style? Derby backed their head coach in a big way in the summer, and to a lesser extent in January. The style of football - or lack of it - appears to be the main reason for replacing Clement. And having spent more than £25m this season, Morris feels the club has fallen well short of his expectations. "We have not made enough progress," was his frank assessment, while the reference to playing "the Derby way" has caused quite a stir. "The priorities were building on the Derby way and style of football enjoyed in the past two seasons, adding depth and strength to our playing squad." Clement twice broke the club's transfer record, signing Hull winger Thomas Ince for £4.75m and Norwich midfielder Bradley Johnson for £6m. But both were dropped at Fulham on Saturday, as were other high-profile signings Jacob Butterfield and Nick Blackman. Derby, less than 24 hours after Clement's exit, announced defender Richard Keogh as their new skipper. Keogh did the job for three years but was replaced by experienced defender Chris Baird at the start of the season. Baird has only started eight league matches this season and the fact that the captain has not been certain of a starting place is clearly an issue. The lack of leadership, the size of the squad and growing fears that Clement did not know his best side led to increasing criticism from supporters, but there were very few calling for a change. Wassall now has the task of "stabilising the ship" until the end of the season and Morris has insisted he will not rush in to appointing the next Rams boss until he is certain they have the man to buy into the plan.